I know I don’t talk about myself all that much here. I’m more interested in telling you about food. But as this is food related, I figured I should mention it here. I know. I really liked my job. And I still really like the restaurant. But sometimes, you have to move on to something else. So I decided to go in search of that something else. And I considered all sorts of things in my search…switching over to bakery work, learning a totally new cuisine, even raw desserts. Then I got lucky. I’m not going to say too much now since it’s not open yet. Let’s just say I’m getting my very own pastry station. Dessert concepts have been submitted and approved. I can get in there and start testing in a matter of days. There’s a lot of work ahead of me, but it’s incredible that I’ve come this far, this fast. Watch this space for more details (including, you know, name and address and opening date). That’s enough of that for now. Let’s move on to the cupcakes I made for this month’s Mystery Box Challenge. This month’s theme, luckily for me, was to make a pretty pretty birthday cupcake for someone special. My mom has a March birthday and what could be more special than that? When I think of my mom, I think of plants and flowers and growing up in a house with a yard full of wild strawberries. 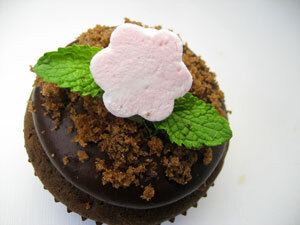 So I made Spring Lawn Cupcakes with Strawberry Marshmallow Blossoms, Fresh Mint Custard and Chocolate Ganache Frosting. Since I’m generally all about flavors over really fancy presentation, I had to think hard to come up with something clever to make these as pretty as possible, so I filled the cupcakes with the pretty green custard to give the cross-section an illusion of roots growing from the soil. Preheat the oven to 350F. Whisk together the cocoa powder and hot water, set aside. Sift or whisk together the flour, baking soda, baking powder and salt, set aside. In a small saucepan, melt the butter and sugar, then transfer to the bowl of a stand mixer and whisk on medium-high speed until cool (4-5 minutes). Beat in the eggs one at a time, thoroughly scraping down the bowl in between additions, then beat in the vanilla. Thoroughly incorporate the cocoa mixture, then alternately add the dry mixture and the sour cream in three additions each. Mix the batter until homogenous but don’t overwork it. Scoop into lined muffin tins, bake 10 minutes, rotate the pans and bake for another 10 minutes. Test the cakes with a toothpick to make sure they’re not wet on the inside before removing from the oven and cooling in the pans for 15 minutes. Remove to racks to finish cooling, then chill overnight, loosely wrapped in plastic. Place the milk and mint in a small saucepan and bring to a low boil, then remove from heat and cover. Steep at least an hour, until the milk tastes “leafy” but not too minty. Once you’re happy with the flavor, return it to the heat. While you wait for it to get hot again, whisk together the sugar, yolks and cornstarch (beat them really hard and don’t let them get too gloppy) and continue whisking until the milk steams. Pour the milk into the yolk mixture through a strainer, whisking constantly. Whisk in the food coloring a little at a time, until it’s a light yellowish spring green color. Once it’s all mixed together return it to the saucepan and cook over medium heat, whisking constantly. Once it becomes thick, taste it, but continue whisking. If it tastes at all starchy, keep cooking it, repeating the process until it no longer tastes like starch. Force through a chinois or strainer into a bowl, then press plastic wrap onto the surface of the custard and cut a few thin slits in it to let steam escape. Let cool in the refrigerator overnight. Pour 1/4 cup of the cold water into the bowl of a stand mixer and sprinkle with the gelatin. Bloom for about 10 minutes. Meanwhile, combine the remaining 2Tbsp water with the sugar and corn syrup in a small saucepan. Bring to a boil and pour into the bloomed gelatin, then beat on the highest speed with the whip attachment for about 8 minutes, until the marshmallow is airy and fluffy. While it’s whipping, prepare a rectangular pan (a loaf pan would be fine, or a small sheet pan) with a generous amount of nonstick spray, then a piece of parchment paper and another layer of spray. Also apply the spray to a rubber spatula. 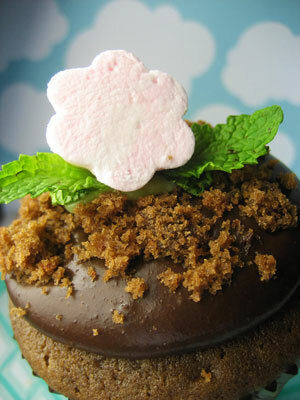 Once the marshmallow is fluffy, beat in the strawberry juice and just enough food coloring to make it light pink. Once fully incorporated, quickly scrape the marshmallow into the prepared pan, spreading it flat if necessary. Top with another piece of greased parchment and let set for at least 3 hours. Once set, cut out flowers with a small oiled cutter. If the pan you used for the marshmallows is small and your marshmallows are very thick, just cut thin slices and stamp out the flowers from there. Toss cut marshmallows in powdered sugar and store in an airtight container. Heat the cream to a low boil and pour over the chocolate. Let it sit for a couple of minutes, then mix with a rubber spatula, stirring in small circles as you go around the bowl. If there are still chunks of chocolate after you’ve fully incorporated the mixture, heat over simmering water, stirring frequently until smooth. Chill, stirring occasionally, until it is thick and spreadable. 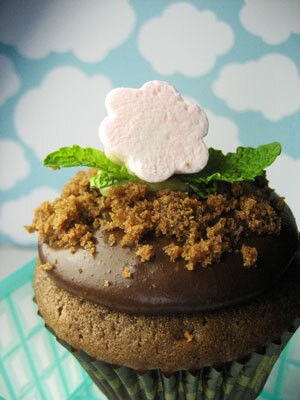 Using a small circle cutter, remove the center of each cupcake. Reserve the “stumps.” Beat the custard with a spatula or a handheld or stand mixer until it is smooth and pipeable and load into a pastry bag fitted with a very small round tip. Fill the cupcakes with the custard, reserving the leftover custard in the piping bag for a later stage of decoration. Put the ganache into a piping bag fitted with a very large round tip and pipe blobs of frosting onto the cupcakes, fully covering the “root” of the cupcake. Crumble up the reserved bits of removed cake and press the crumbs into the frosting. 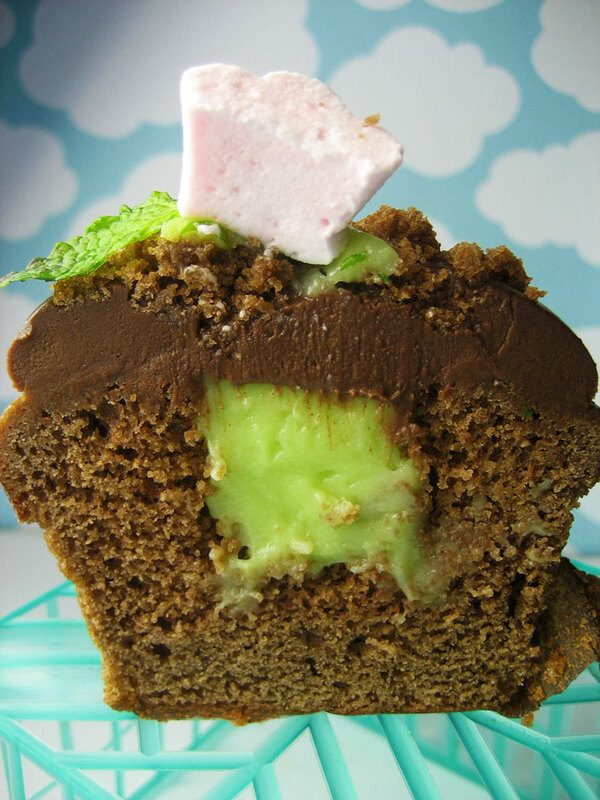 Pipe a small circle of custard onto the top of the cupcake and arrange two or three mint leaves on it, then press in a marshmallow flower. Awe, the cupcakes are beautiful and thank you for the tribute! I love that you made a garden themed cupcake for your mom! I had the same inspiration. I’m also digging the combo of things you used to decorate – I’ll definitely be stealing the mint custard and marshmallow recipes. Very cool cupcakes!